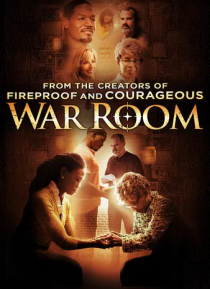 From the creators of Fireproof and Courageous comes WAR ROOM, a compelling drama with humor and heart that explores the power that prayer can have on our lives. Tony and Elizabeth Jordan have it all - but appearances can be deceiving. Their world is actually crumbling under the strain of a failing marriage. But their lives take an unexpected turn when Elizabeth meets her newest client, Miss Clara,… and is challenged to establish a "war room" and a battle plan of prayer for her family.